The humble TIL302, produced by Texas Instruments, is one of the most popular and heavily used early LED display types. First produced in the early 1970s, the TIL302 has been in continuous production for decades. Few would suspect that such a common device could be interesting, but the TIL302 went through a number of dramatic design changes during the first years of its production. 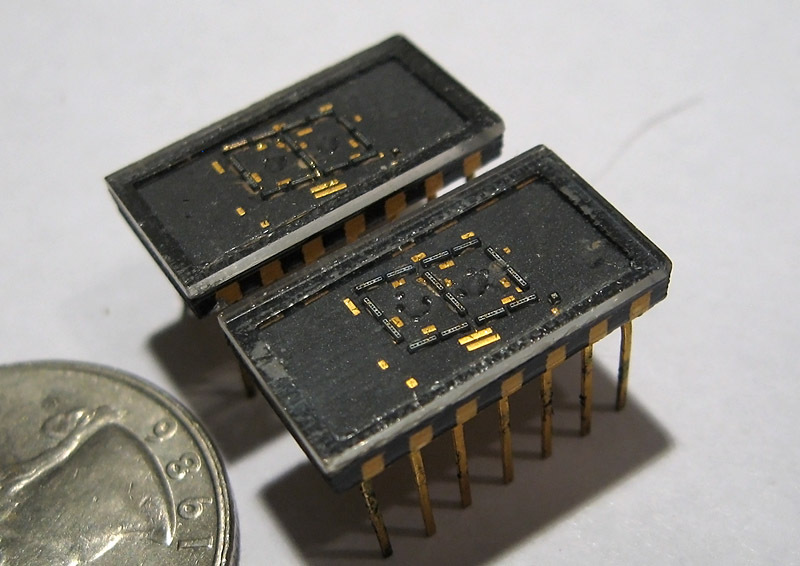 The earliest TIL302s are constructed out of individual bar dies mounted to a fiber carrier with gold traces and leads, which is then sealed in clear epoxy. All of the traces outside the digit area are painted with black paint. This results in a very attractive display, but was likely expensive to manufacture and TIL302s of this style were only produced for a short time prior to 1972. Starting in 1972 TIL302 displays were produced with tinned pins and traces and no black paint overlay, which saved on cost but resulted in a singularly hideous appearance. Texas Instruments quickly converted to a third version of the display, which introduced the now standard red cast epoxy and ceramic PCB common to all of Texas Instruments early LED displays. This version was a success, and TIL302 displays of this style were produced in huge quantities. Texas Instruments also produced a military grade variant of this display, which used identical LED dies, but was encased in a ceramic bathtub package with a glass lid and bottom braised pins. 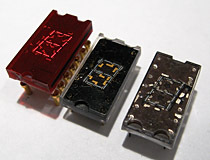 Texas Instruments TIL302 LED display, various versions. The middle display is the earliest style of TIL302, with the second version of the display appearing on the right, and the final version appearing on the left. 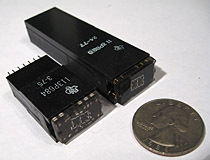 Texas Instruments produced a number of of specialty sockets for its display line. Shown here are two different styles used to provide knob clearance when mounting TIL302 displays in test equipment front panels. Part numbers are 113P684 and 113P826. 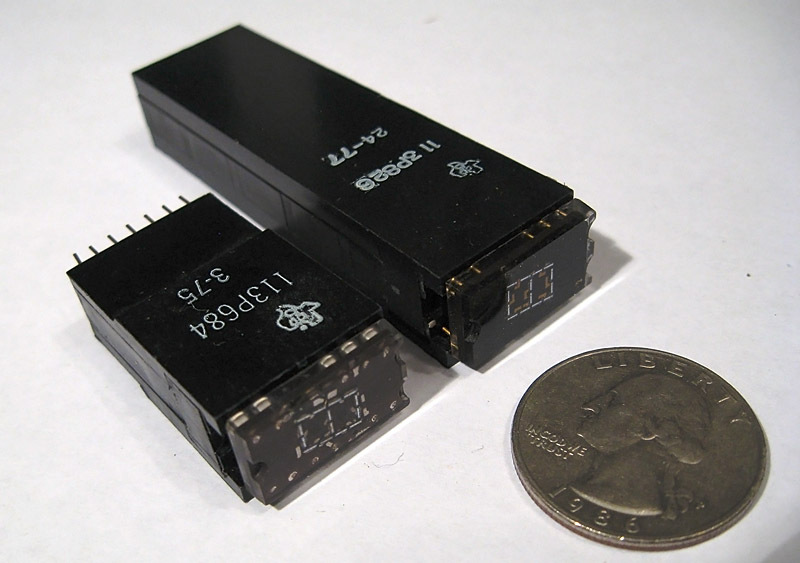 A pair of Texas Instruments DIS302 LED displays, a military grade variant of the TIL302.